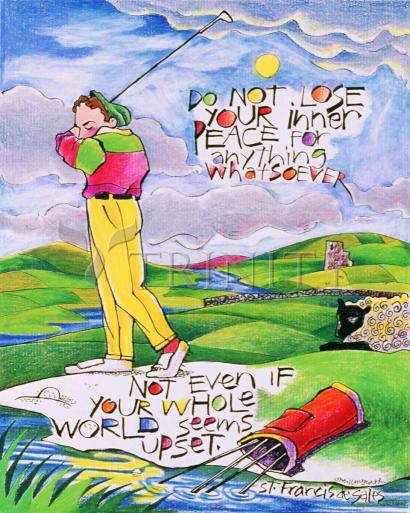 Do not lose your inner peace for anything whatsoever. Not even if your whole world seems upset. Francis de Sales' books, the most famous of which was Introduction to the Devout Life, which – unusual for the time – was written specially for laypeople. In it he counseled charity over penance as a means of progressing in the spiritual life. Sales also left the mystical work, the "Treatise on the Love of God", and many highly valued letters of spiritual direction, including those with Jane Frances de Chantal compiled in the Letters of Spiritual Direction. He was a notably clear and gracious stylist in French, Italian and Latin. influenced Jean Eudes to develop the devotion to the Hearts of Jesus and Mary. Along with St. Jane Frances de Chantal, Sales founded the women's Order of the Visitation of Holy Mary (Visitandines) in Annecy on 6 June 1610. Despite his friendship with Denis-Simon de Marquemont, the archbishop nonetheless restricted the freedoms of de Sales' new order in 1616 by ordering that its members live cloistered lives. Sales also established a small community of men, an Oratory of St. Philip Neri, at Thonon-les-Bains, with himself as the superior or Provost. This work, however, was crippled by his death, and that foundation soon died out. In December 1622 Sales was required to travel in the entourage of Charles Emmanuel I, Duke of Savoy, for the Duke's Christmas tour of his domain. Upon arrival in Lyon, he chose to stay in the gardener's hut at the Visitandine monastery in that city. While there he suffered a stroke, from which he died on 28 December 1622. St. Francis de Sales has been styled "the Gentleman Saint" because of his patience and gentleness. Despite the resistance of the populace of Lyon to moving his remains from that city, Sales was buried on 24 January 1623 in the church of the Monastery of the Visitation in Annecy, which he had founded with Chantal, who was also buried there. Their remains were venerated there until the French Revolution. Many miracles have been reported at his shrine. Sales' heart was kept in Lyon, in response to the popular demand of the citizens of the city to retain his remains. During the French Revolution, however, it was taken to Venice, where it is venerated today. Francis de Sales was beatified in 1661 by Pope Alexander VII, who then canonized him four years later. He was declared a Doctor of the Church by Pope Pius IX in 1877. The Roman Catholic Church celebrates St. Francis de Sales' feast on 24 January, the day of his burial in Annecy in 1624. From the year 1666, when his feast day was inserted into the General Roman Calendar, until its 1969 revision, he was celebrated on 29 January, a date still observed by some Traditionalist Catholics. Having been founded as the first non-cloistered group of sisters after attempts to do so with the Visitation Sisters founded by de Sales and de Chantal proved unsuccessful, the Sisters of St. Joseph (founded in Le Puys, France, in 1650) take St. Francis de Sales as one of their patrons.